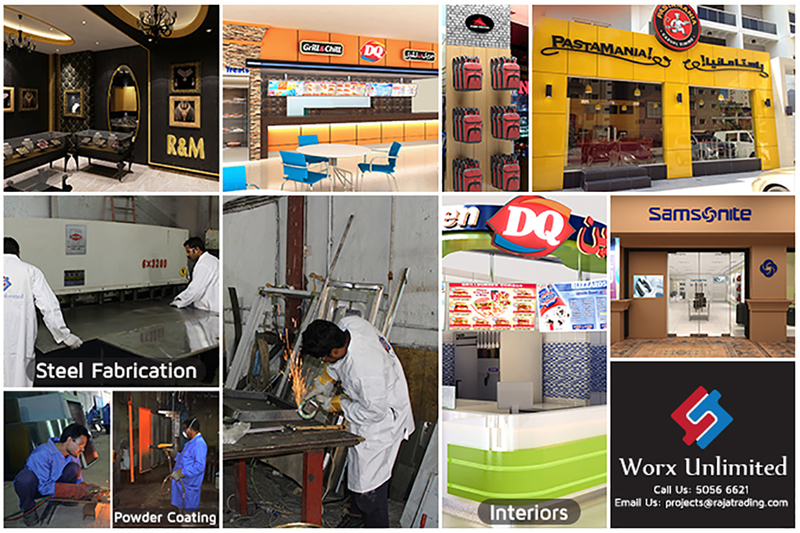 Worx Unlimited Co was established in 1997 as a Contracting Division of Raja Company. Since then it has undertaken numerous successful inhouse and external steel fabrication projects, and its reliability has earned it recognition as a quality fabrication workshop. Worx uses innovative technology to design, fabricate, engineer and customize mechanical metal products. Worx specialized in Fibre Laser Cutting, Steel Fabrication of Fire Cabinets, Cradles, Floor Cabinets, Oven Trolleys, Gas Burners, Wall Shelfs, Wall Cabinets, Flanges, Ladders, Suction Strainers, Anti Vortex, and Kitchen Furniture. Worx Unlimited greatest asset is its close knit team of eminent technicians who are committed to maintaining the highest level of customer satisfaction. Their professional workmanship is complemented by the most up-to-date industrial precision fabrication machinery. Add to this combination, their focus on thoroughly understanding the customers requirements, matching this with quality materials and treating each component as a labour of love, and what you have is a formula for getting things right everytime all the time. Small wonder that project owners and engineers seek out Workx Unlimited services whenever pricision workmanship and delicate handling is called for. It doesn't hurt that Worx Unlimited has a record for delivering on time and within budget. Worx Unlimited has enormous experience in the field as contractor / sub-contractor and also offers other services such as preparation of budgetary offers, cost estimations for executing and completing projects. This is to assist our valuable customers to prepare and understand the site work budget prior to actual expenditure.